While attending a social entrepreneurship course in July 2012, Dublin-based business student Chris Rooney was tasked with coming up with a new sustainable housing system for developing countries that would use recycled materials in the process. Upon assignment of this brief the first phone call made by Chris was to his father, Jim – a Belfast based architect with 30 years experience. 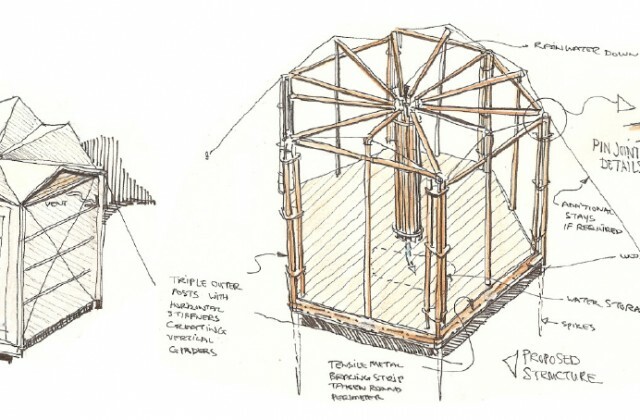 Chris’ initial thought was to use reinforced cardboard to create a flat-packed hexagonal house which could be assembled as an emergency shelter for disaster victims. 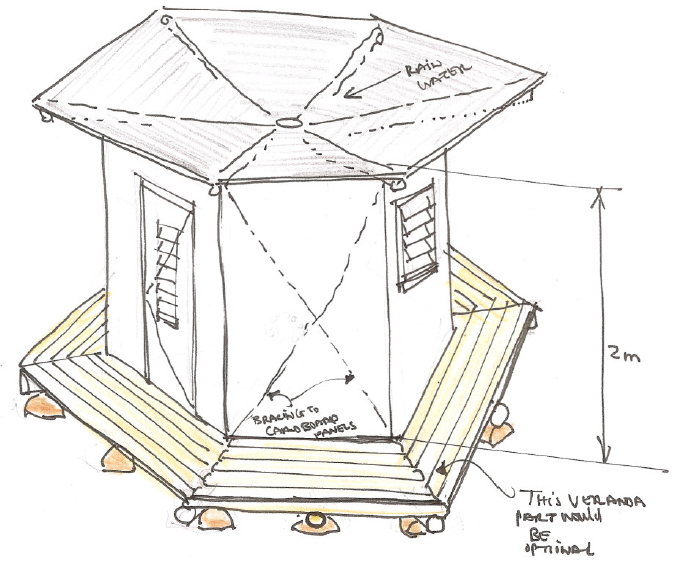 After some brainstorming, Jim sketched the initial concept for Hexi-House (right) complete with a water capture system on the roof which will filter rain water down through the house via a central pipe into a basin thus provide a source of clean water for disaster victims. From this initial concept drawing of Hexi-House the team looked at a way of fully exploiting the structural properties of the hexagonal plan form using the outer walls and structure to provide support for the inwardly sloping roof capable of capturing rainwater. The floor would be raised off the ground to ensure the living area was kept dry at all times. An emphasis was placed on maximizing the use of readily available, lightweight and sustainable materials to creating a modular building that could be assembled quickly from a kit without the need for skilled labour. The manufacture of most of the components would be done in a factory setting but any common elements that could be sourced locally (such as wooden pallets for instance) would be omitted from the kit in an effort to reduce haulage costs and minimize Hexi-House’s carbon footprint. The team is also exploring the possibility of customizing Hexi-House using it to form part of a matrix that could be built to cater for a wider range of uses. Using appropriate protective finishes, the life expectancy of the house would be 3-5 years and within that time period it could be taken down and reassembled if necessary. At the end of its life, most of the components could either be recycled or reused to help make further Hexi-Houses. SIZE – From the initial concept sketch, the footprint of Hexi-house was increased in size to 8msq with each side panel being 1800mm long. This would be capable of providing sleeping accommodation for a family consisting of 2 adults and 2-3 young children. ROOF SHAPE – To address the possibility of a blockage occurring at the central outlet to the roof a circular folded plate roof was developed consisting of 12 triangular panels interconnected at the joints with flashing tape.The pitch at each ridge element would be 12.5 degrees and at each valley it would be 2.5 degrees. This would ensure that, should the central outlet become blocked, only a minimal amount of rain water would be trapped on the roof at any time. DURABILITY OF CLADDING – The external panels will be made up of double skinned, reinforced and water resistant cardboard panels approx 1800x550mm ht. The team is now intent on firming up some of the critical dimensions and details associated with Hexi-House and they plan to illustrate these over the coming weeks. This will then allow the team to develop a 3D model of the proposed design which it hopes will create a clear demonstration of the unique characteristics and the potential versatility of Hexi-House. Can it be possible to make a design of Hexi-House for building to prevent from disaster?